Modern and contemporary prints are an extension of a long and illustrious lineage that goes back to the Renaissance engravings of Albrecht Dürer, and the 17th century prints of Rembrandt, Rubens, van Dyck and Claude Lorraine. The diffusion of printmaking throughout Europe in the 18th century drew in the Italians, Tiepolo, Piranesi and Canaletto, the mystical Englishman, William Blake, and the Spanish master, Goya. The posthumous 1863 publication of Goya’s powerful suite of prints, Disasters of War, was of major import, coincident with and an influence upon the emergent Parisian avant-garde who would come to be known as the impressionists. Picasso and Matisse, the prototypical “moderns,” began making original prints in the first decade of the 20th century, followed in the 1920’s by Chagall. All three of these artists created voluminous bodies of work. Picasso is represented in this show by prints from the 1930’s through the 1960’s. Matisse is likewise shown across a wide swath of time, with works from 1906, the Fauve period, through the Jazz Series of 1947. Examples from Chagall include selections from his first suite of color lithographs, Four Tales of the Arabian Nights, published in 1948. Marino Marini, though best known as a sculptor and particularly for his bronze horse and rider at the Guggenheim in Venice, was trained primarily as a painter and produced some of the most painterly prints of the 20th century. Favoring the etching and aquatint processes, he was able to achieve subtle effects not unlike those of watercolor and gouache while employing a rich and characteristically Italian palette of unlikely yet sumptuous color combinations. Leslie Sacks Editions has published the English language catalogue raisonné of Marini graphics, documenting the artist’s work in prints from 1919 through 1980. Important Modern and Contemporary Prints includes two of the strongest works from Marini’s Shakespeare portfolios, which are considered the pinnacle of his graphic production. The artists of the New York School (1940’s and 50’s – Pollock, Rothko, Kline, et al.) are represented with important prints by Robert Motherwell and Helen Frankenthaler. The Motherwells include Burning Elegy and two of his signature red etching aquatints, Gesture and Mexican Night II. Frankenthaler, once married to Motherwell, is the last surviving major figure from the abstract expressionist period. She is represented by her most recent large-scale print, Book of Clouds, a multi-process work in aquatint, etching, woodcut and pochoir with hand coloring. Burning Elegy and Book of Clouds are characteristic of the New York School’s penchant for creating large works that fill the viewer’s field of vision and thereby create an immersive experience. Frankenthaler and Sam Francis were both associated with lyrical abstraction (aka in France, tachisme and art informel) which followed from abstract expressionism. The Francis work in this show is a dynamic, large scale monotype (unique print) with hand coloring, from the 1980’s, and shares its “super graphic” quality with Frank Stellas from the same period, specifically, excellent examples from Stella’s Polar Coordinates series. At this point in the chronology we run into a problem of nomenclature as to what differentiates modern from contemporary. One could logically argue that if an artist is alive, the art is contemporary, but the issue of style makes things more complicated. This problem is perhaps most pointedly underscored by the work of the contemporary and quite lively David Hockney, who has explicitly emulated Picasso, Matisse and most recently van Gogh. 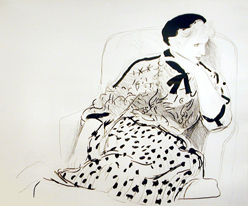 Several of Hockney’s greatest prints are featured in this show: an important lithograph, Hotel Well III, which references cubism and thus indirectly Picasso, Celia in an Armchair which indirectly references late Matisse, and Rue de Seine which contains a very direct reference to Matisse’s earlier Nice period. As Hockney is one of the most scholarly and intellectually acute artists of our time, one may assume that apart from personal predilection as to style, he has used style as a statement. If one considers his dedication to draftsmanship – the most fundamental aspect of all artistic practice -¬¬ and his choice of subjects, these being predominantly still life, portraiture and landscape, it may be said that he’s cut against the grain of critical vogue, paying little attention to the conceptual apart from reaffirming the primacy of modern and classical values though his choice of styles and subjects, as evidenced by the selection of prints in this show. Though reality doesn’t fully cooperate with efforts to put art into neat little boxes, if one had to select a movement or moment that represents a break with modernism, and so signifies the beginnings of what we call contemporary or post-modern art, it would be the advent of pop art ca. 1960, when high concept and irony came to replace romanticism, including the stereotypic image of the artist as a solitary individualist on an esoteric quest for communion with his or her muse. Conversely, with pop we see the appropriation of images from culture at large, as in the works of Roy Lichtenstein whose silk screens, Seascape and Still Life with Red Jar, appear in this show. By appropriating, as the key motif for his style, the benday dots of which photo-mechanical lithographic images are comprised (the tiny dots used to create images in the printing of magazines, newspapers and posters) Lichtenstein referenced mass media and with it popular culture, beginning with his cartoon images. Departing from this imagery, his later works embrace impressionist, modern and even classical imagery in architecture, thus riffing, ironically, on pop art itself. Printmaking was perhaps the art form most relevant to Lichtenstein’s style, being that he appropriated his signature motif from mass media printing technology. Jasper Johns was at the forefront of pop with such iconic images as the American Flag, but unlike most of his pop contemporaries who were obsessed with image and concept, Johns’ has always maintained a painterly aesthetic. This can be seen in the painterly quality of his prints. In so doing, Johns’ prints, along with his paintings, have preserved the place of painting in a contemporary art world wherein painting has been increasingly subordinated to concept (though this trend seems to be in the nascent stage of changing). The Johns prints in this show include Cicada, Between the Clock and Bed, and one of his best known images, a Savarin Coffee can – holding paint brushes. Jim Dine has long sustained an orientation similar to that of Johns, achieving painterly effects with print making processes. Additionally, Dine often embellishes entire editions with hand painting. Moreover, he has underscored the primacy of drawing with many editioned prints that are effectively drawings produced in multiplicity (as is the case with many of Hockney’s editions). Be it graphite pencil on paper or lithographic pencil on a stone, a drawing is a drawing nevertheless and it is the mastery of this most fundamental of all artistic skills that separates the merely conceptual from classic art, though it should be said that the two are not necessarily mutually exclusive. Dine is represented in this exhibition with a large, intensely graphic robe entitled Very Picante, made with an unusual technique employing cardboard plates. Also shown are two of his Venuses in etching and aquatint, classical icons if ever there were. Chuck Close has become an iconic name in contemporary art, but the underpinning of his signature style – portraits comprised of intricate patterns of pixilated colors – have precedent in neo-impressionism, best known from the late 19th century divisionist, aka pointillist landscapes and seascapes of Seurat and Signac. This said, the thinking behind Close’s work is different than that of the neo-impressionists, and he’s taken the basic form of divisionism to the next level with the development of complex patterns and free form designs within those patterns. Important Modern and Contemporary Prints includes Close’s tour de force self portrait of 2007, a huge 187 color silk screen image measuring 68 x 74 inches. Each color requires a separate screen, and the registration (alignment) of all of the screens is critical, thus a work of this complexity is a staggering technical accomplishment, which in combination with his artistry makes this perhaps the most important print of the new century to date. Lastly, looking at the amazing 1981 work of contemporary French etcher Erik Desmazieres, L’Atelier Rene Taze III, takes us back to where this narrative began, in reference to the intricate 16th century engravings of Albrecht Dürer, the etchings of Giovanni Piranesi, Jacques Callot and other early masters of European printmaking. Desmazieres’ obsessively detailed, affectionately rendered image of a print shop and its venerable press eloquently express the importance of printmaking, not only in the eyes of this artist, but in the eyes of all of the artists, curators, gallerists and collectors who have fallen under the spell of the print.